The most significant point to remember, when an individual does stretching exercises for back pain, is to begin with five repetitions. Afterwards, if such number of repetitions did not cause any problem, repetitions can be increased gradually, to as much as fifteen. It is essential to warm up for a few minutes before doing the stretching proper. This is one of the simplest back stretching exercises meant for back pain relief. This is done by placing oneself on the floor on all four hands. Slowly, he pulls his abdominal muscles toward the floor, creating an arch on the back. After a few seconds, he raises his back toward the ceiling. At first, it is advisable to do 5 repetitions, slowly building up to 15. This exercise is meant to ensure back muscles worked to the fullest to achieve pain reduction or even elimination. This stretching meant to reduce low back pain effectively is considered one of the easiest to perform. Anyone can do this anywhere, at any hour of the day. An individual must sit on a stable chair, while making sure that the buttocks rest firmly on it. He starts bending down slowly as he keeps his hands relaxed. These low back stretches are easy, yet effective ones for back pain. Likewise, a stretching exercise is the piriformis stretch, which involves the muscle found in the gluteal, or buttocks, muscles. The piriformis muscle rotates laterally, which is meant to stabilize the hip flexor muscles. A stretching option is to keep the hips open to stretch piriformis muscle while being seated in a cross-legged position on the floor. Before an individual performs such stretches for low back pain, he must first consult his physician, physical therapist or healthcare expert. Again, it is imperative that he avoids in becoming overenthusiastic when performing the stretches; otherwise, he will simply acquire additional body injuries, other than the back pain. For many patients, many of these benefits will be enjoyed if they follow a back stretch routine. A particular patient will be assigned exercises that are designed especially for him by his physician or physical therapist. 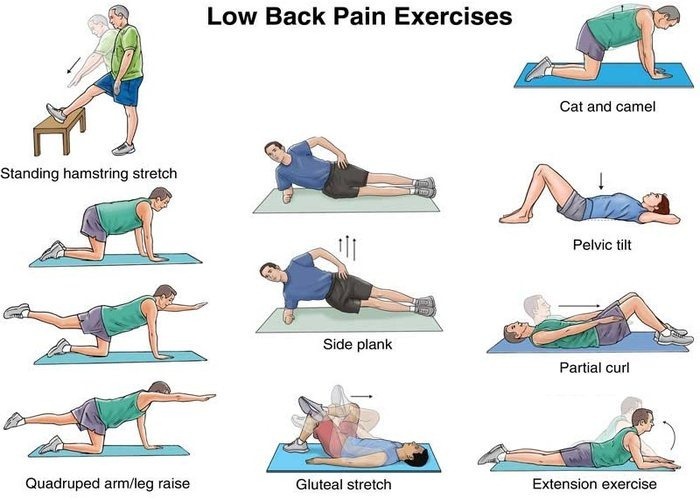 Generally, low back pain patients must focus on stretching the back and abdominal muscles, hips and legs muscles. An essential tip to follow is to avoid bouncing movements during stretches. All stretching routine must be done in a gradual manner. Stretches, if done correctly, will treat any back pain. However, many patients complain that, after awhile that they experienced comfort from their particular exercise program, they suffer the same kind of back pain. There are reasons which cause back pain to recur. For one thing, many patients are not consistent in doing the stretching exercises. Whether it is a set of stretching exercises that a patient devised for himself, or exercises recommended by a physical therapist, it is a must that they are done continuously. Indeed, it is a must that a patient performs the stretching exercises for the duration of time prescribed by his trainer or doctor. It is a must that he maintains the basic core stretching, as well as strengthening, exercises all throughout the recommended period. Likewise, he must strictly follow all stretching routine that was assigned to him. He might have to do adjustments whenever necessary. For instance, his physical therapist may reduce or increase sets and repetitions of the exercises. It is possible that he will disregard a particular exercise and perform a new one. Indeed, there had been instances when patients who had low back pain and are successfully relieved of such pain because of back stretches, complain of the same type of back pain problem after a year or two. It is likely that these patients strengthened their low back and abdominal muscles by performing the appropriate exercises, promptly taking off the stress from their lower back. However, patients who believe that they have been permanently cured because of such back pain exercises decided to discontinue the routine. Unfortunately, this results to the recurrence of the exact low back problems which cause pain again to the patient. Hence, it is a must that when an individual is treated successfully with stretching exercises, whether in the lower back or the entire spine area, he must continue with maintenance, stretching exercise program. This will help sustain the progress in the low back muscles brought about by lower back stretches.